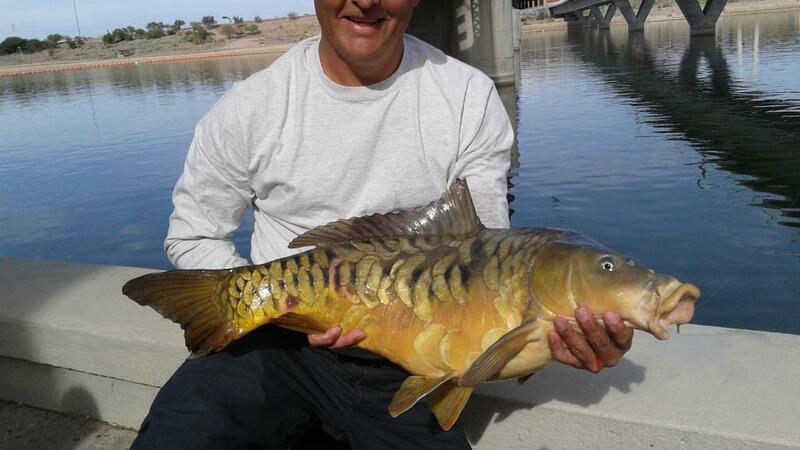 For any AZ anglers out there, the good news is that TTL has some great mirrors. The bad news: The lake is being drained in February to replace the dam and the fish will not be saved. Nice mirrrors by the way! I'd imagine they will stock it again once they fill up, right? Those are some stunning mirrors in there. I'm curious, will those fish just die when it drains or will the fish end up relocating themselves elsewhere in the river? It's a shame. 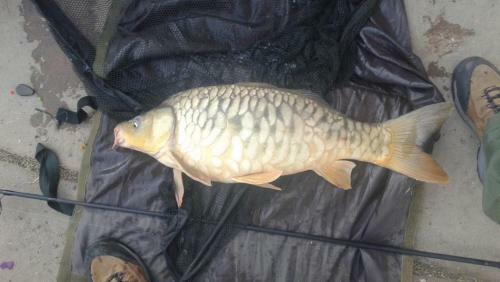 It might be possible that some of the carp will survive in the main channel or move upstream. BTW, those are nice mirrors! It was my understanding that the lake won't be completely drained? Something like 70% drained. 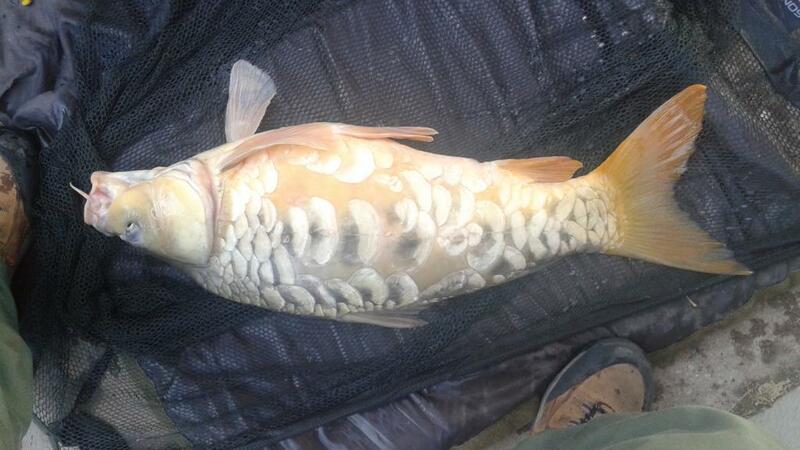 And of the fish species in the lake... 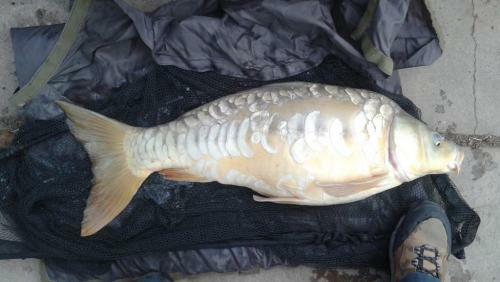 The carp will be the ones that survive. This article says 2/3 of the water will be diverted. I think many of the bigger mirrors will survive with 1/3 of the water in the lake. All hope is not lost! It is possible that some water will remain in the lake, however, I base my opinion on what happened a few years ago when the inflatable dam burst and all the water washed downstream. The inflatable sections act like gates or doors and extend the full height of the dam. So when they broke, all the water was lost. There were several hundred fish left dead and a group of volunteers cleaned them up to donate to a local zoo alligator who was well fed for several months. The City will be removing the inflatable portions of the old dam. I can't see how they will be able to accomplish that and retain water at the same time. Apparently the City has made some sort of agreement with State fish and game department to allow unlimited harvest of all fish. I have not see anything official from fish and game yet, so until I do, I don't believe any of the rumors. 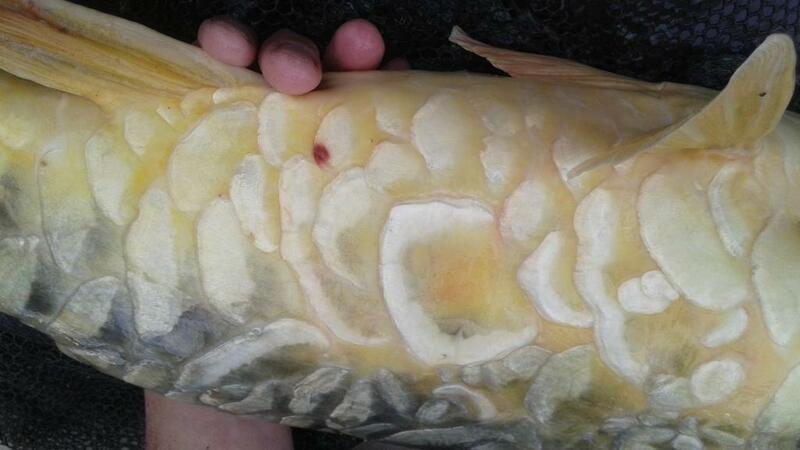 If they do allow unlimited harvest, the carp are goners. 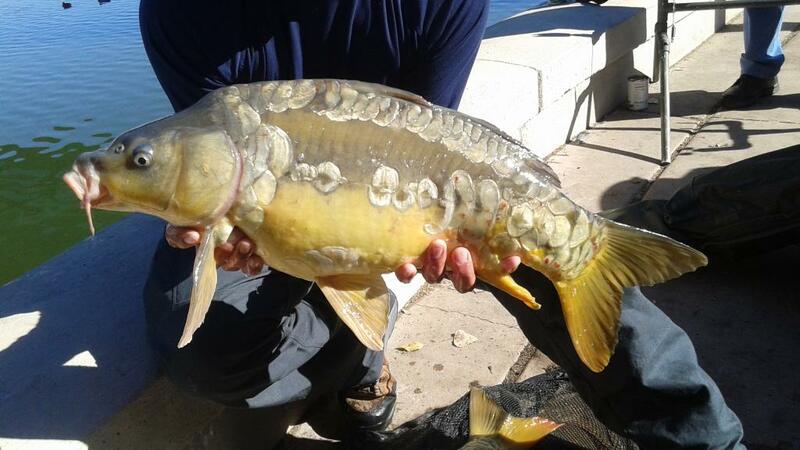 As a side note, when the dam broke and flooded out, it was restocked with 70,000 fingerling mirror carp. Will they do that again? I don't know.... The City has been building up the area as a special high rent waterfront district since the dam was first put in about 15 years ago. The inflatable dam was chosen so it could be removed if the concept proved to be a bad idea. Now with a dozen high rises on the "waterfront", the iron man triathlon and several other big money events, the big money talks and now we are stuck with the lake even if it's a bad idea with the new permanent dam. Keep in mind that this lake is entirely manmade, it never existed here in the DESERT. Since water is pretty scarce in the desert, I'm glad the big money is clouding everyone's judgement, NOT! Sorry Franky, there will be no sight fishing. The way the lake is constructed, you wouldn't be able to reach the lowered water from the concrete shore, and if you climb down the concrete, the City considers that unsafe, so to enforce it, they charge you with trespassing. ForkHorn, When they say "diverted", they mean that the water is going to pumped out of the lake into the SRP (local power generating station) canal system over a series of weeks. They made a deal where the city gets money from SRP for the water. I believe the remaining 1/3 will be lost down stream during deconstruction of the old dam. Right, I forgot about the way it is constructed. 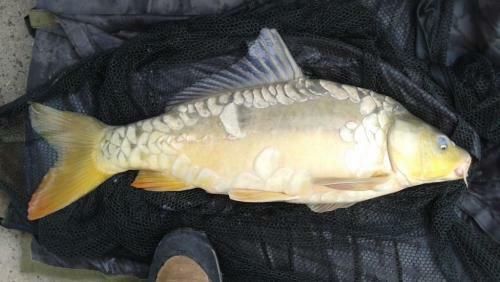 Oh well, at least there are a lot of carp in that area. Hopefully some make it in TTL though. Stocked with carp? That is something that isn't seen very often. 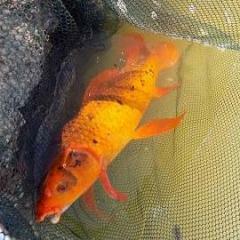 Wish you guys knew someone with a pond. 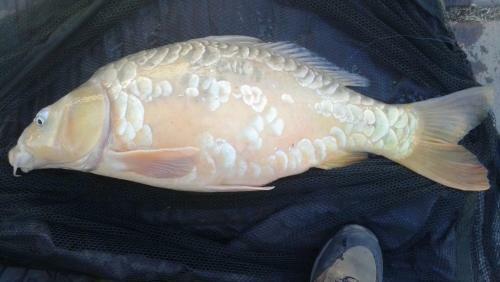 SoCal, If you get out this way next year, give me a shout and we'll find some carp. If not TTL, then we can hit some other urban spots. Not sure about the "ghost" part, what defines that? 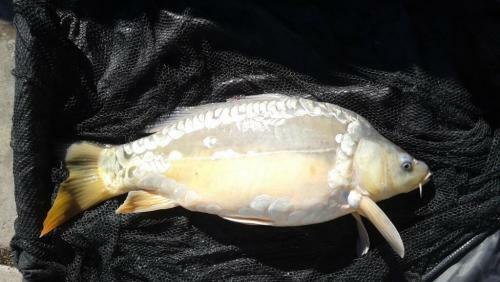 There are many similar fish in the lake, so all of us just refered to them as ligher colored than the standard mirrors. Not sure about the "ghost" part, what defines that? Cross between a mirror (or common) and a koi. Seems like most of the fish in there look that way, and I don't think there are many, if any, koi in there. Had a great session at TTL today. 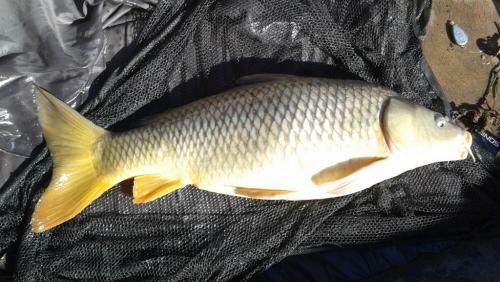 Four hours of fishing and 10 carp landed. One of my best sessions ever. 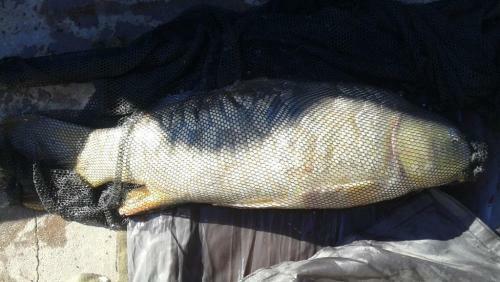 Two largest were between 18 and 20 lbs. I misplaced my scale, so no exact weights. 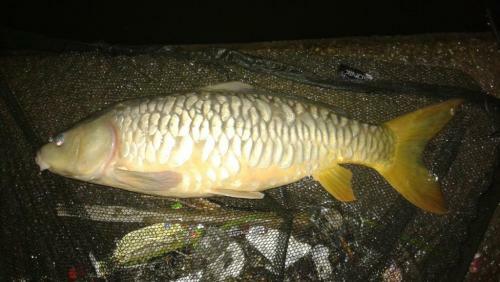 It got so crazy, I had three sets of doubles and couldn't even get one out of the net to photograph it! The common is my first common from the lake. They appear to be rare in this particular body of water.